Wishing all of you a wonderful Mother's Day celebration. A wonderful day to celebrate your uniqueness. Love you all. A little planted floral handbag for each Mother to take home. Another little take home gift. 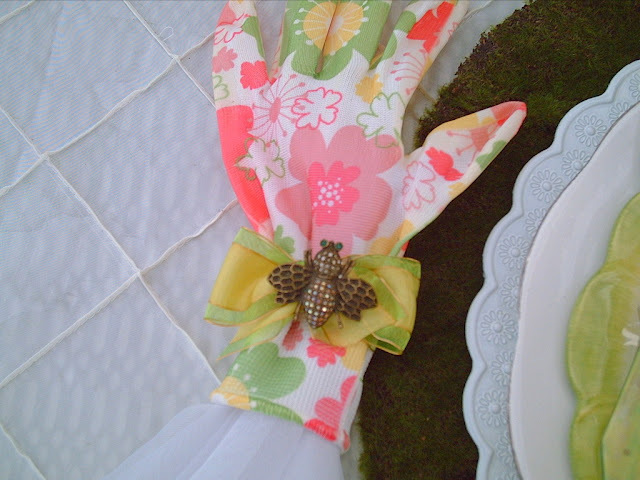 Each girl will take home a pair of garden gloves and an adorable pin/brooch. Each pin is different, as you will see in other photos. My little cloche's. They were white and I wanted them to be a matching green, so I spray painted them. There are so many wonderful colors of spray paint available now. No better backdrop than Mother Nature's gift of a glorious lilac bush. 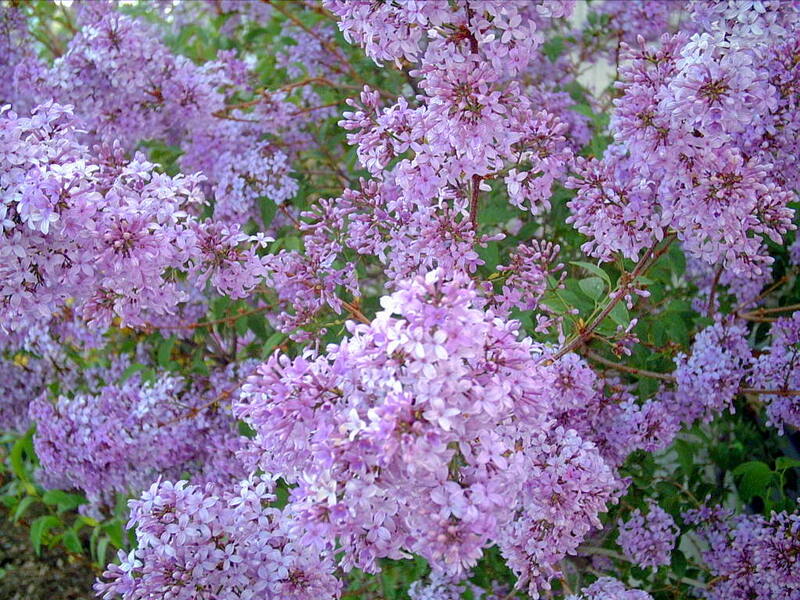 This one is a Korean lilac. Blooms a little later than my other bushes. The heady fragrance can be enjoyed from many yards away. Because I live in a high altitude area with intense sun, I had to plant this on the East side for protection from the intense sun. Most of the standard varieties French, etc., work great in any part of my yard. 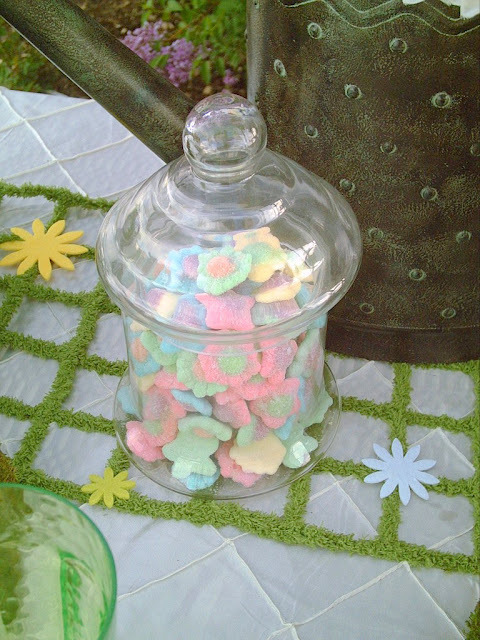 I love the little sweet & sour flower candy. Found at my favorite Pharmacy gift shop. 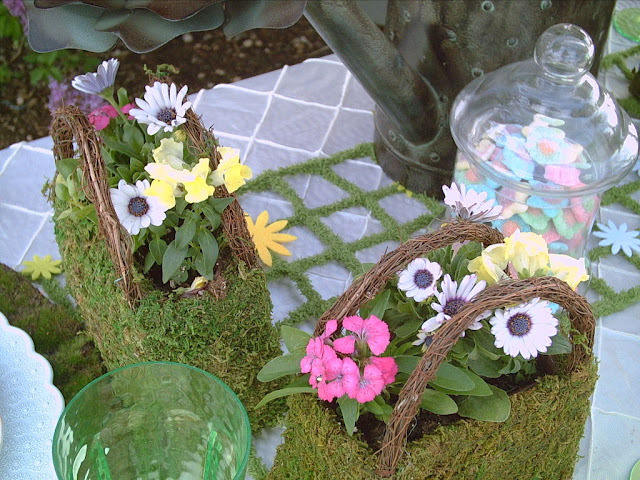 I used a large watering can for the centerpiece. 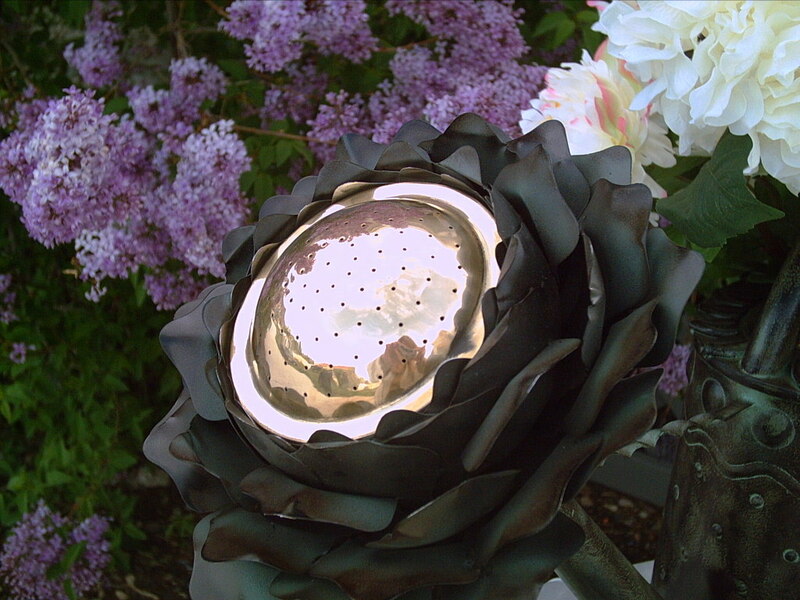 The spout is a large brass Peony flower. The spout of the watering can. 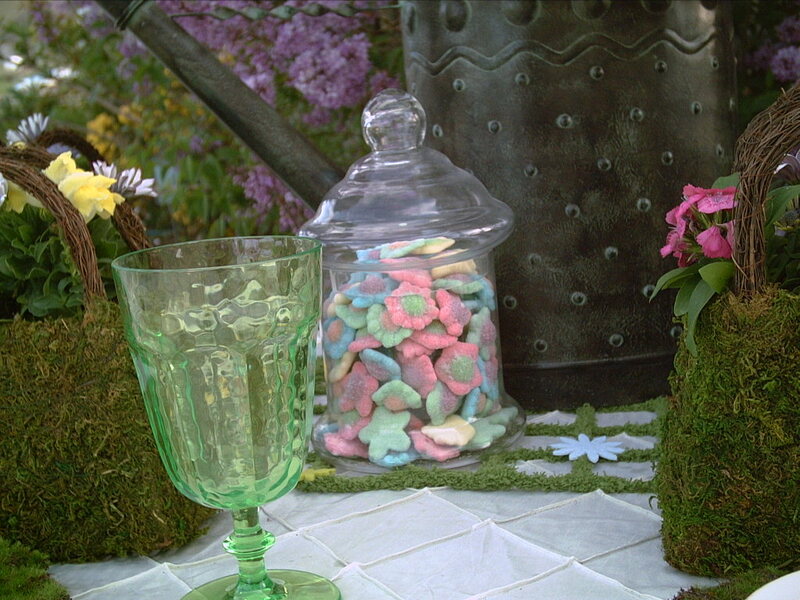 A dreamy picture of the tablescape. I love the softer focus of the flowers. Please feel free to leave a comment below. Thank you so very much for taking the time to look at my tablescape. 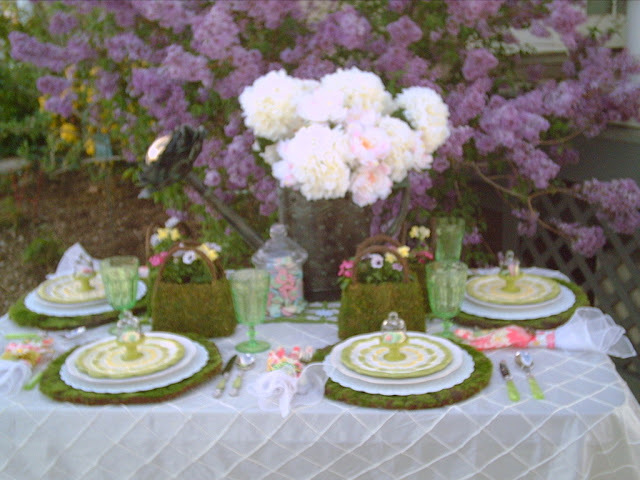 I will be posting my Mother's Day 2016 Tablescape at Between Naps on the Porch, for Tablescape Thursday. I am swooning over your beautiful table! I keep at photo after photo, discovering new little details each time I look at them. 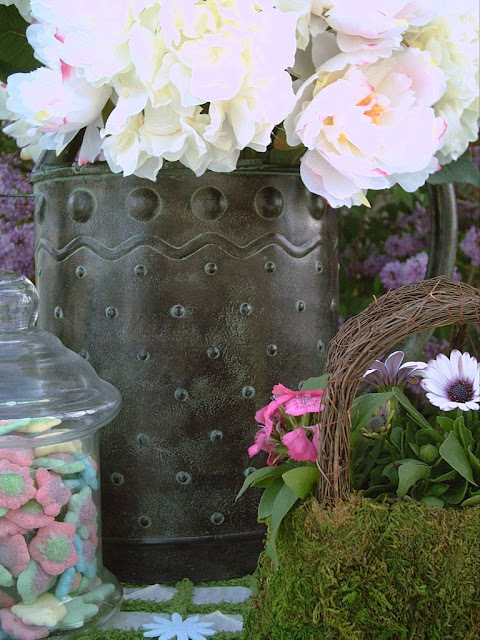 That watering can is stunning, and those little moss pocketbooks!! Too, too cute! I am pinning this and sharing over on Facebook. Thank you so much for sharing at the Celebrate Your Story! link party! These pictures are magazine worthy and I would love to experience this in person. I love the way you pay attention to each detail and make sure all of the elements work together. Have a wonderful Mother's Day! 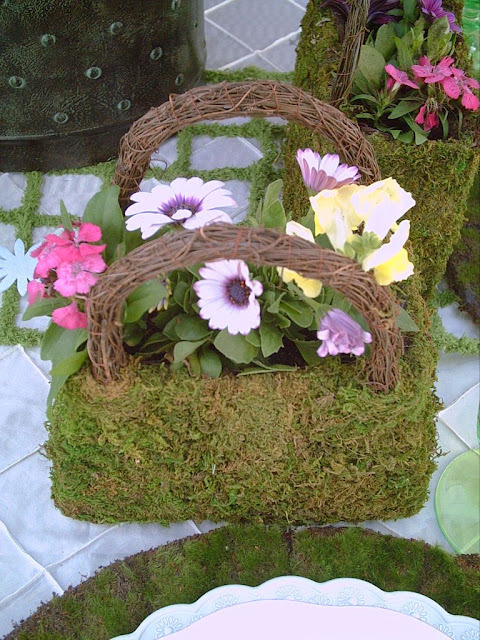 Oh you know I love those flower handbags- they're just as cute as can be! What a great for the recipients! 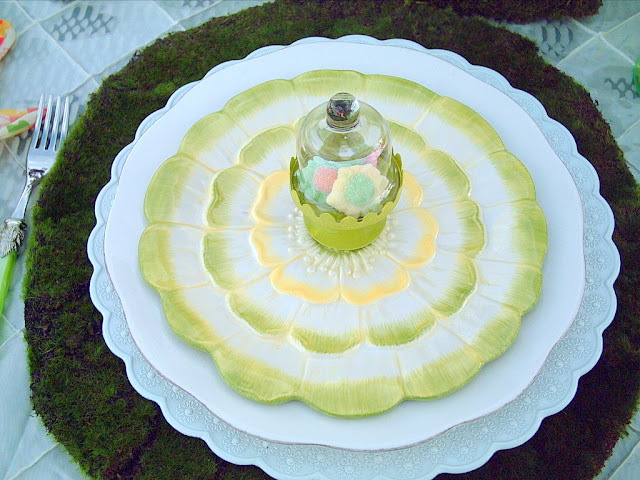 The little cloche's are adorable and I love the those pretty flower dishes. How lucky to have lilacs blooming just in time for Mother's Day. I adore their scent. That watering can is precious. I have one from MacKenzie Childs with a fancy spout but not in a brass finish. Love, love, love this post... absolutely beautiful and well, delightfully delicious, too!! 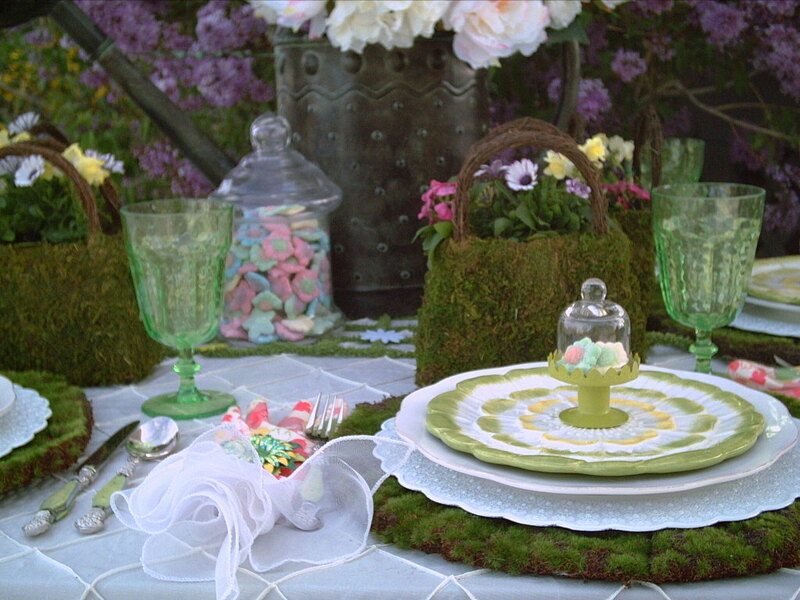 !The colors are amazing... Love all the moss green... makes me wish my kids were nearby to celebrate Mother's Day....I'll just make Hubs take me somewhere special....!!!!!! Oh how I wish I were at this beautiful table! 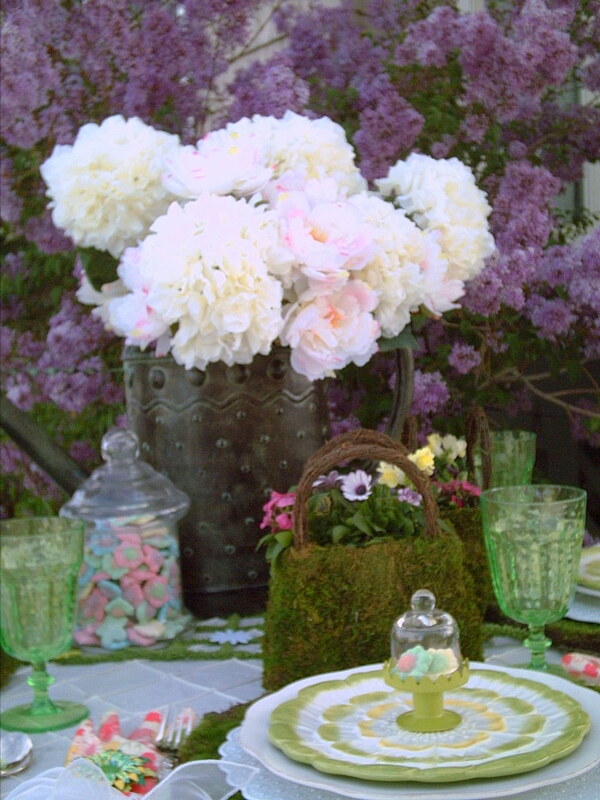 I wouldn't even have to eat, I could just sit and take in all the beauty of the lilac, the purses, the little cloches and the beautiful setting! I love that watering can too! 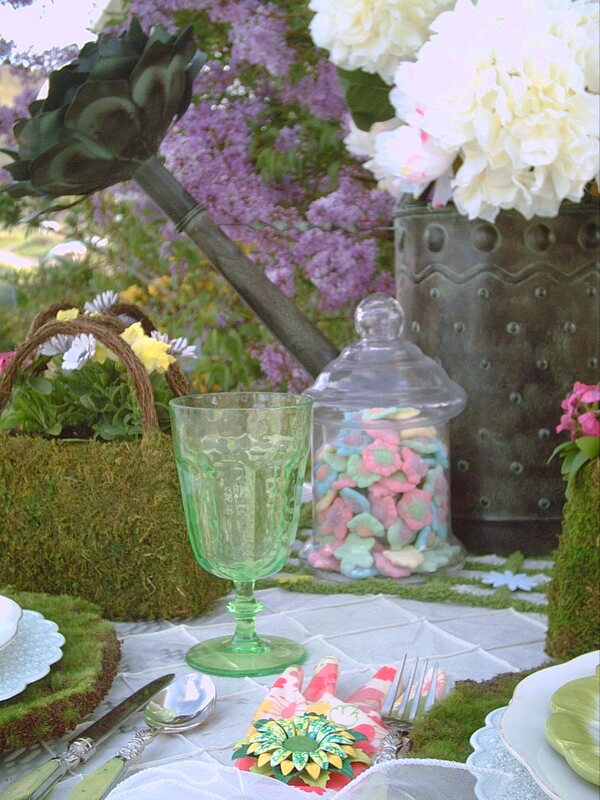 Where did you find the organza napkin overlays???? 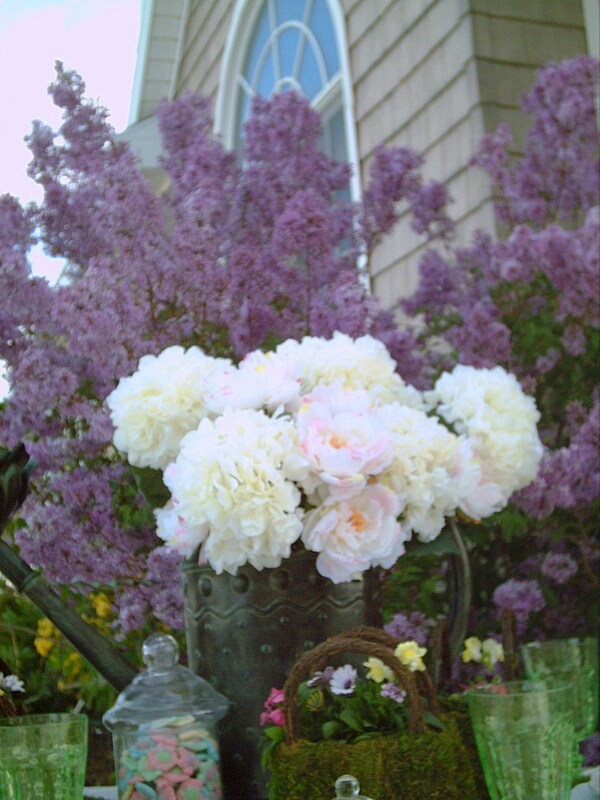 Wow your peonies and lilacs are gorgeous! What a elegant table setting. I know your guests were so impressed. I'm curious how you made the handbags. Very impressive. Oh my, those handbags are simply perfect. 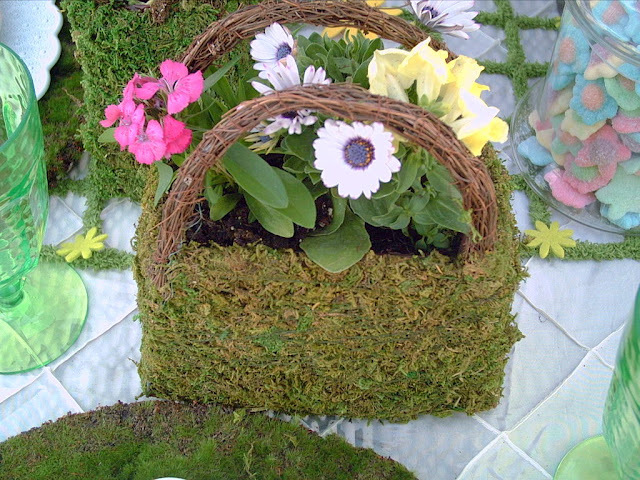 I love flowers, especially little flowers, but little flowers in little handbags, well, that's just simply irresistible. I must try to make something like that sometime. Thank you for stopping by, and for the lovely comment. This tablescape is absolutely darling. 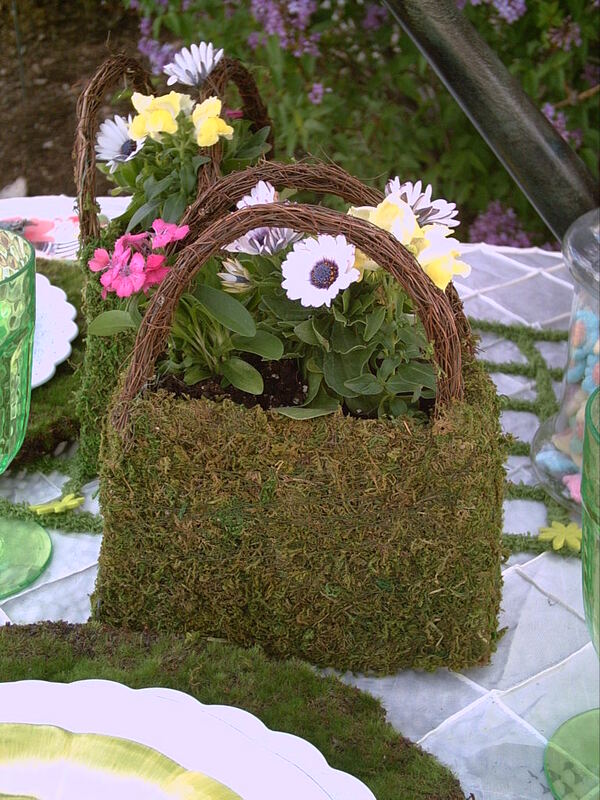 The potted purse or handbag is so adorable and unique. The water can is do different too. 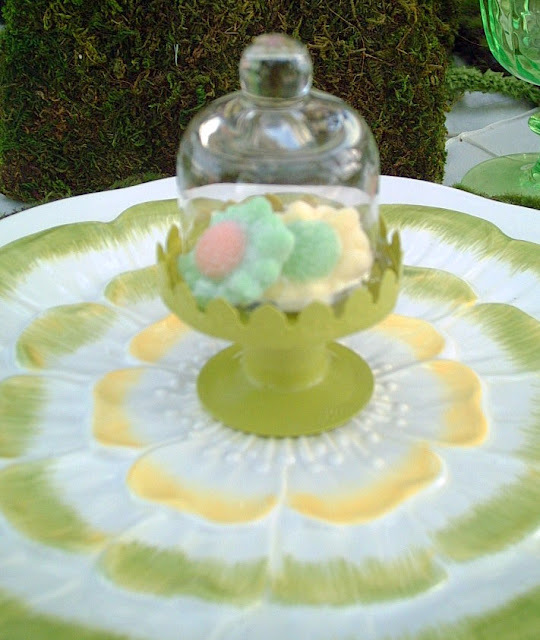 I haven't seen anything like it and it makes such a charming centerpiece for your table. 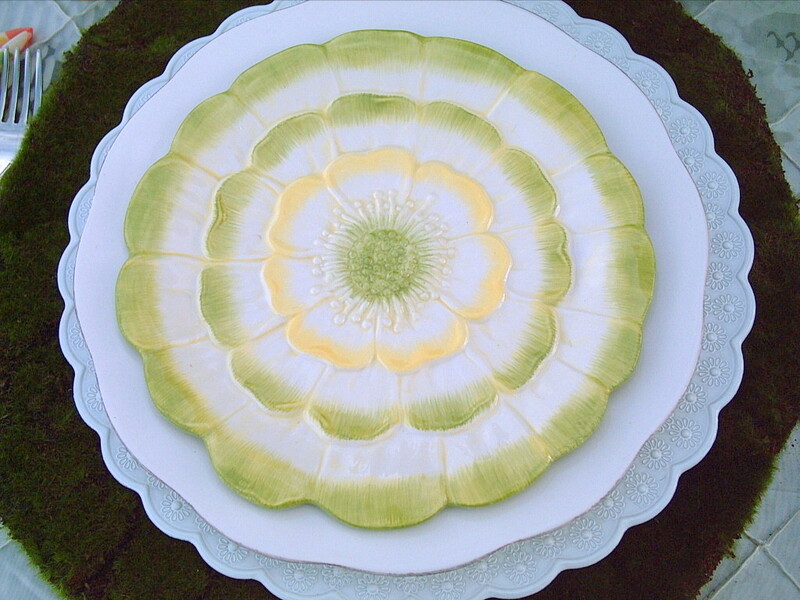 I am in love with your flower plates and flatware. So pretty. Happy Mom's Day. And thank you for your comment on The Little Yellow Corner Store. Valerie, this table is so enchanting. 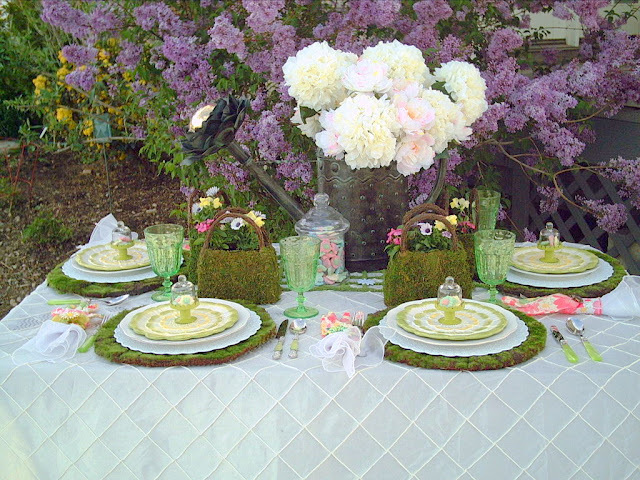 Love the outdoor setting with your garden accessories. How cute are the floral handbags. 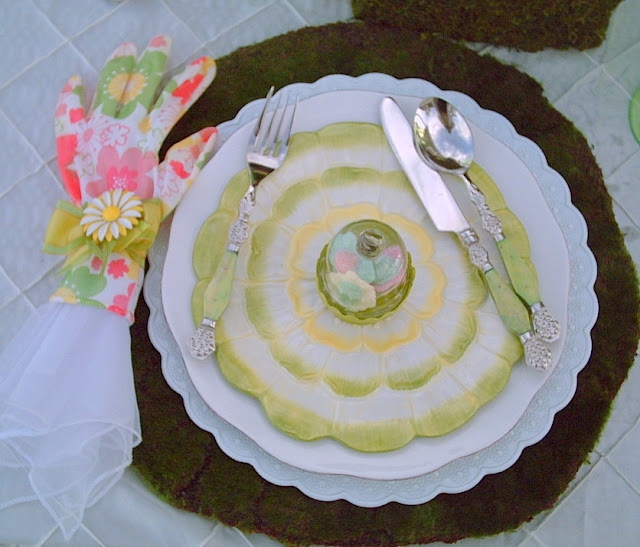 Love the plates too, especially accessorized with garden gloves and a brooch. Beautiful backdrop from Mother Nature. Have a wonderful Mother's day. What a delight! I'm sure the mother's all felt so special. You are so creative! Thanks for sharing at Dishing It & Digging It! Did you make the little purses? What an awesome Mother's Day spread my friend! 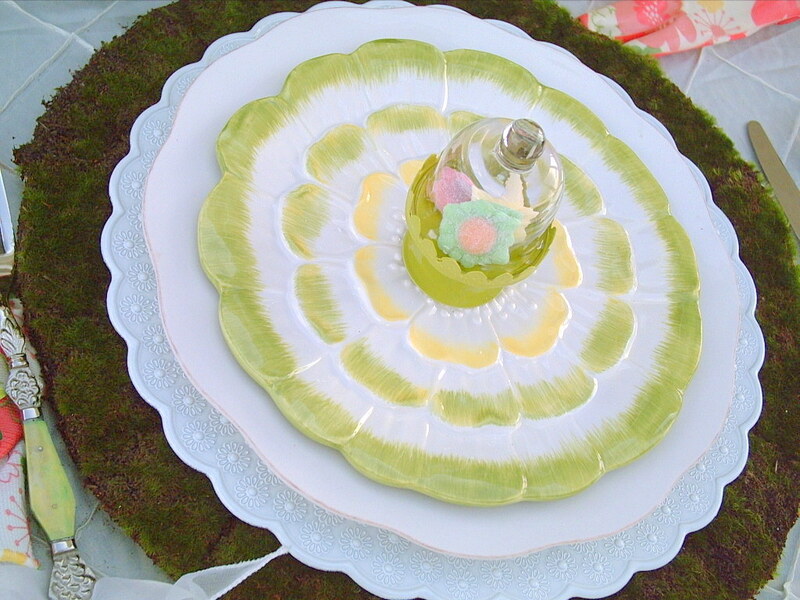 The dishes are gorgeous and it makes it for such a happy, sweet tablecape. 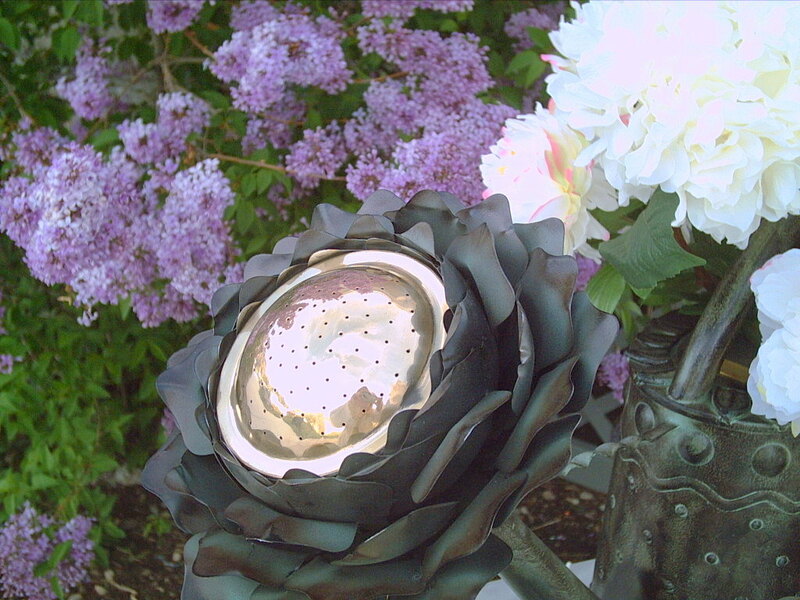 You are very talented and I love the al fresco setting at your lovely garden too. This is so pretty. Those little hand bags with flowers are wonderful. Where in the world did you find those, or did you create them? How perfect for Mother's Day. I love the way you put the gloves with the napkin and secured them all with the pretty pins. Your flowers (on the centerpiece and in the garden) look gorgeous, and what a special watering can. This table is magical. Valerie, we have just been in Europe, so I haven't done a table for a while! Never fear, I will always be addicted to tablescaping!! I love your table. 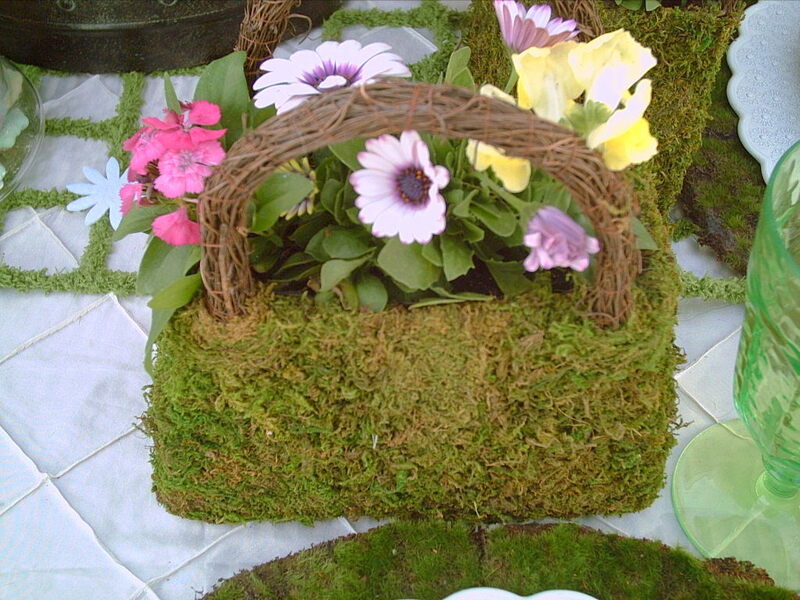 The mossy purses are so adorable. What a fun and cheery table, makes me wish the weather were a little nicer here! What a darling table! Those little cloches are just too cute. What a great idea. Thanks for sharing.